Don’t let the embers die without having a quick sweet fix. This recipe is easy to prepare, looks pretty and tastes fabulous. Cut 2 squares of thick foil, about 40cm x 40cm. Pile the blackberries on to 1 square. Bend the sides up slightly, drizzle with the cassis and sprinkle with the golden caster sugar. Add the split vanilla pod and top with the second foil square. Fold in the edges to create a loosely sealed bag. Place the foil parcel on to the barbecue grill for about 15 minutes, or until the parcel puffs up (or cook in an oven preheated to 200°C, gas mark 6 for 15-20 minutes). Meanwhile, put the brioche slices on the barbecue for 1 minute on each side until toasted and lightly griddled. 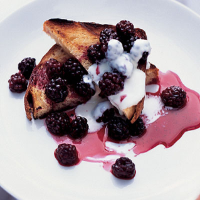 Serve the blackberries on the toasted brioche and top with crème fraîche. Try using other combinations of berries and liqueurs, such as strawberries and Cointreau or peaches and apricot brandy.